This peanut butter Oreo cake features three layers of chocolate cake, peanut butter cookies and cream frosting, and a decadent chocolate peanut butter ganache. Okay, admittedly, I’ve been holding on to this recipe for a while – since before I even started the blog! But I tested this cake again recently and am excited to finally share it with you! I just hope you aren’t sick of peanut butter and chocolate by now (please say no! )… Because there is sure to be more of that where this came from here at Flour Covered Apron. Consider that fair warning! 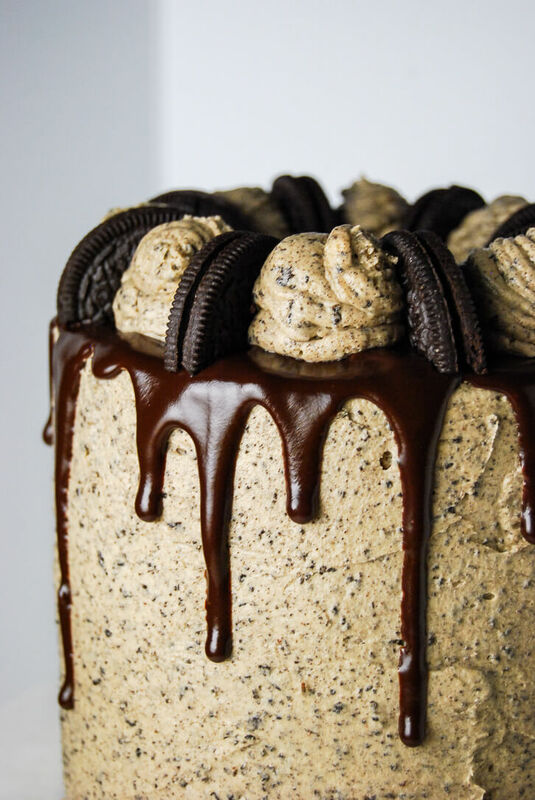 The inspiration for this peanut butter Oreo cake came over the summer, when a good friend of mine made a big batch of homemade peanut butter cookies and cream ice cream. Knowing how much of a dessert/peanut butter/chocolate/ice cream aficionado I am, she insisted I “had to try it”. And I obviously wasn’t going to let that opportunity pass me by!! She tried to sneak me a spoonful while her two-year-old (whom I absolutely adore) wasn’t looking, but to no avail! That sweet girl is one smart cookie and she ended up getting her own ice cream too. So, we were all happy campers! I fell in love immediately with this twist on the classic cookies and cream flavor. And the pairing of the creamy peanut butter with the crumbled Oreos got me thinking about a peanut butter Oreo cake! So I folded some crushed Oreos into my favorite peanut butter frosting and it was magical. For the layers on this cake, I went with a “classic” chocolate. But, I have to tell you about an ingredient in this cake recipe and I’m afraid it might freak you out… Are you ready? Okay, I made this chocolate cake with mayonnaise! If you’re not down with that idea, feel free to head over to the recipe for this peanut butter cup cake and use my go-to (mayonnaise-free) recipe for the chocolate cake instead. But, if you’ve never tried it before, I think you’ll be surprised by how good a little mayo can be in a chocolate cake. Just give it a try and let me know what you think! But why mayonnaise, you ask? There’s a popular hot dog restaurant here in Chicago that is famous for its chocolate cake milkshakes and I’ve always heard they use mayo in the batter. So, I’ve been interested in experimenting with that myself for a while. But also, it was 9:30PM when I decided to bake this cake and I was out of oil. Not wanting to head to the store, I needed a good substitute! When you think about it, mayonnaise is mostly just eggs and oil, which you would use in a traditional cake anyway! And of course, you won’t actually taste the mayo in the cake at all. It will just help make your cake tender, light, fluffy, and perfectly moist – all good things! In case you were wondering, I usually buy the mayonnaise made with olive oil, and that’s what I used for this recipe. I took this peanut butter Oreo cake to work and it disappeared so fast that when several people decided to go out to lunch before getting cake, they ended up missing out! I’m pretty sure that’s a strong argument for living by the motto “life’s short, eat dessert first!”. A three layer chocolate cake with peanut butter cookies and cream frosting and a peanut butter chocolate ganache. Preheat oven to 350 degrees and line the bottoms of three six-inch cake pans with parchment paper. Then, butter and flour the pans. In a medium size bowl, whisk together flour, cocoa powder, espresso powder, baking powder, baking soda, and salt. In a large bowl, with a mixer, beat together the eggs, sugars, and vanilla. Add mayonnaise and beat until combined. Add hot water and stir by hand with a wooden spoon or rubber spatula. Divide batter evenly between three prepared cake pans. Tap pans gently on the counter to remove excess air bubbles. Bake at 350 degrees for 33-38 minutes, or until a toothpick inserted into the center of the cake comes out with just a few moist crumbs attached. Let cakes cool in pan for 5-10 minutes, then turn out onto a wire rack to let cool completely. Beat softened butter and peanut butter with a hand beater, or the paddle attachment of a stand mixer, until smooth. With the mixer on low speed, gradually add powdered sugar until incorporated. Then, add vanilla and salt and mix to combine. Add milk one tablespoon at a time, beating until combined after each addition. Beat on high speed until smooth and fluffy. Place 11 Oreos in the bowl of a food processor. Pulse until crushed finely. Ensure that there aren't large cookie pieces (which will make it difficult to frost your cake). Using a rubber spatula, fold crushed Oreos into the peanut butter frosting. Once the cakes are cool, level each layer using a sharp serrated knife to cut off the rounded domes. Place bottom cake layer on a cake board, using a small amount of frosting to keep it in place. Top with frosting and spread it evenly with an offset spatula. Place second layer on top, frost, and finish with the third layer (cut side down). Frost top and sides of the cake with a thin layer of frosting (crumb coat). Place cake in fridge to chill for about 20 minutes. Finish frosting the cake, reserving some frosting to decorate the top of the cake, if desired. Return the cake to the fridge while you make the ganache. In a small saucepan, heat chocolate chips and cream over medium-low heat, stirring frequently, until chocolate is completely melted and mixture is smooth. Remove from heat, add peanut butter and vanilla, and whisk until smooth. Pour into a glass jar or bowl and let cool until no longer hot and ganache drips slowly, but fluidly off a spoon. Spoon ganache around the edge of the cake, pushing it just over the edge so that it drips down the side of the cake. Fill in the center and smooth top with the back of a spoon or an offset spatula. Chill until ganache sets. Fill a pastry bag, fitted with a large, open round piping tip with the frosting. Pipe large dollops of frosting around the edge of the cake. Decorate with Oreo cookies as desired. *Make your own buttermilk by adding 2 teaspoons of white vinegar or lemon juice to a scant 3/4 cup whole milk. Stir and let stand for 5 minutes before using. This cake was a hit at our girls night this weekend. Everyone loved it! Easy to make and even easier to eat. The mayo in the cake makes it super moist and I was licking the frosting off of a spoon. I’ll absolutely be making this again! Thanks Sarah, so glad you enjoyed it! 🙂 Best girls’ night ever!